A Wheat Free Wonderland | After losing 123lbs on the Dukan Diet, this blog will now share the ups & downs of my wheat free life, my thoughts, experiences and favourite recipes. Oven 375 / 190 / Gas Mark 5. In a large bowl, combine all dry ingredients – almond flour, flax, salt, spices. Mix in butter / shortening, honey and vanilla. Work mixture with your hands until it forms a dough. Gently work in chopped pecans / walnuts with your hands. Put everything in a pan, bring to the boil and let boil for 5 minutes. Turn heat down, leave lid off and let simmer for 5 – 10 minutes (get rid of as much cooking liquid as you can without the apples beoming a mush!). Just want the apples to start softening as they will be cooked fully in the oven. Remove from heat and let cool. I did try this recipe without pre-cooking the apples and it just didnt work in my opinion, the topping was cooked but the apples were still too crunchy. 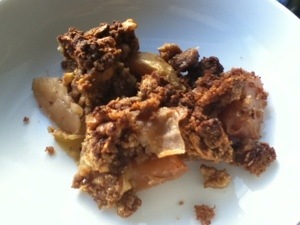 Place cooked apples in a pyrex / oven safe container. Sprinkle dough over top of apples. Bake in oven for 30 – 45 minutes. Remove from oven and allow to cool uncovered or serve immediately. Great recipe, especially in winter. I love the flexibility of this recipe, you can change up the spices, how you sweeten it. Add lemon juice to apple it you prefer a more tart taste. I served mine with some coconut cream, very yummy. Pizza Base – gluten free, egg free, dairy free, yeast free. Mix ground almonds, starch, baking powder, salt. In seperate bowl mix flax, water and oil. Whisk together until it thickens, takes a minute or two. Add thickened flax mixture to dry ingredients. Mix really well. Divide dough in half. Grease 2 cookie sheets with oil / melted butter to prevent sticking. (Dough is very sticky consistency.) Press dough out with fingers / rolling pin. Will stick to rolling pin. I tried using parchment paper, but found it to be more troublesome than useful. Aim for 1/16th inch thickness. Should make 2, 12” x 16” pizza’s. Place in oven and parbake for 22 – 24 minutes, until edges are golden and crust is cooked through. Remove from oven and top with ingredients of choice. Bump up oven heat 400 / 200 / Gas Mark 6 and bake for an additional 15 minutes. Can turn on grill to speed up process if you wish. Taste – good, slightly nutty. Texture – nice, similar to shortcrust pastry. 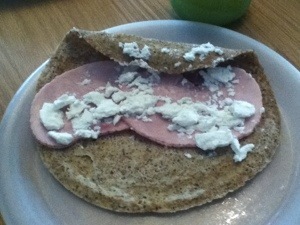 I halved the recipe and it worked well, very filling, I couldn’t eat all the base. Mean Green is aptly named!!!!!! Let me start off by saying that I have never been a fan of greens, I’ve always only been able to tolerate a little cabbage covered in gravy 😉 and I was even adventurous enough to try kale in Anna’s Coconut curried stew a while ago but greens are by no means a staple in my diet. So starting with this juice is maybe a little fool hardy, but ”in for a penny in for a pound” as they say (I’m not actually sure who they are! LOL). 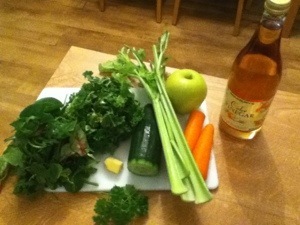 The ingredients I used seem to be what people generally seem to include in this kind of juice. I would really love to try the millions of different fruit concotions there are but I know that will not help improve my health any, especially as I have gut flora issues, sugar feeds the bad stuff!!!!! BOO…….. It was very strong……. 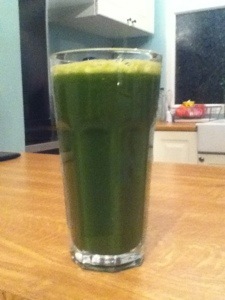 It’s amazing how all the flavours of the vegetables hit you at different times as the juice moves over your tastebuds. Very interesting experience! I won’t pretend that I loved it, but, over a lot of ice, it was tolerable and by the end I was enjoying it and got a little pick me up from it, which was nice. I got an itchy rash on my hand after drinking it but that could have been from something else I’ve eaten today, no tummy distress yet either, which is a good sign I think. Looking forward to trying different recipes. Got a lovely bag of pulp (leftover fibres) to use as a great base for a soup or stew. I will drink 1 – 2 juices per day to improve my nutrient intake. 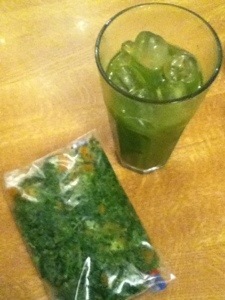 Once I get used to the tastes / textures a little more then I will decide on Juice Feasts / cleanses. It’s just like starting any different eating plan, it takes time to adjust. When I started Dukan, I didn’t know how I would manage without pasta, rice, potatoes, etc but you get used to it and when you see the positive changes because of it, it enforces it as a good behaviour and encourages you to keep it up. You may ask why I have been looking into juicing? Thursday evening (same day as I did my last post) I was feeling a little unwell and all of a sudden my tongue started to feel very sore, like I had a load of ulcers in the centre of my tongue, it felt all tingly, fizzy might actually describe the sensation better, I went to look in the mirror and I had black spots where I thought the ulcers were!!!!!!!!!!!!!! Flamin’ Nora!!!!!!!!!!!!!! I had about 10, only the size of a pin head, some a little smaller, but its not a nice thing to see in your mouth, quite scary really. I looked online and there are various causes, etc, etc, I could turn into a right hypochondriac the amount of medical literature I have read in the past few months!!! HeHe…. Please don’t say I have already….. I checked Traditional Chinese Medicine guides, they were quite an interesting read. I also found a good article ”What your tongue can tell you about your health” on Yoga Today. My body is literally screaming at me from every pore begging me to do something. I do feel a little better today, the vitamins and probiotics must be doing something, I felt like I actually had some energy. (I got vitamin drops B12 and D, but I’ve also got a lot of tablets/capsules to take (up to 14 a day!!!! ), it makes me gag! I’ll just have to get over it 😀 !!!) My problem is I am deficient in everything but cannot tolerate eating the vegetables that will give me the nutrients I need. Most fruits, fibrous vegetables or vegetables with resistant starch in are a no no for me at the moment. Kind of limits the options!!!!!!!!!!! I read a Paleo forum discussion on juicing, a lady with an autoimmune condition commented, she couldnt tolerate certain vegetables and said she juiced them instead without any problems. Then I remembered a great blog I follow by Anna called Adventures in Transformation, she did a 92 day Juice Feast and is currently walking the wilds of Australia, amazing lady, she writes so beautifully, a very calming blog to read, it must be in the name 😉 (Anna over at Oceannah has the same affect on me). Her juicing experience was pretty inspiring, now at this moment I dont know whether I will suppliment with juices or do a Juice feast / cleanse. I thought I would try out a few recipes and then make a decicison based on the taste. Could I stand just drinking juice???? Anyway I feel I need to do something pretty drastic, the GAPS / SCD diets I have been looking at are pretty restritive (for obvious reasons) so I’ll have to see, make an informed choice. 7 hours uninterrupted sleep last night. Bliss…. 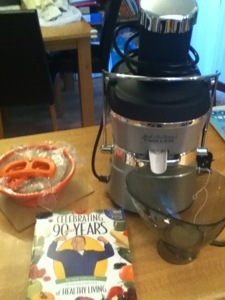 Feeling excited about juicing possibilities. Try out juicing (on the menu celery, cucumber, kale, spinach, watercress, rocket, carrots, ginger, green apples, mint and parsley) obviously fruit and higher sugar content veg like carrots will be in lesser quantities but I have a feeling without something ‘sweet’ I won’t be able to drink it. Any advice / tips about juicing very welcome!!!!! Thanks…..
Food wise, on / off plan would best way to describe it. There are reasons for this. Bear with me. Health wise it has been a bit of a roller-coaster since September. 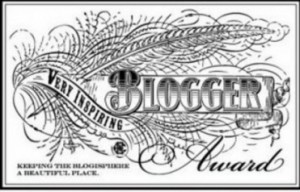 Those who have followed my Dukan blog know that during Dukan I had a few niggles relating to my digestive system, possible food allergies, etc. Since September (adding in wheat / sugar) (removing wheat / sugar) these problems have been amplified 100 fold. Mid December I felt so atrocious I even took a trip to the doctors. Those who know me, know that I hate doctors and would have to be feeling completely at the end of my tether in order to go and see one. Anyway, I went and wished I hadnt. I wish I was surprised by this outcome and we had a health profession that actually cared but as we all know money talks and because we dont ‘pay’ for our health care in the UK (except through national insurance contributions deducted from earnings) the level of care isn’t really up to much, in my limited experience. I went in explained a few of my symptoms whilst trying to give her a little background about my weight loss, she felt my tummy, went back to her desk, started working on the computer, as I was about to tell her the rest of what had been happening, the printer started whirring away and she handed me a 7 page document on IBS and said at least it helps to know what the matter is with you, read this. Well, I had worked myself up so much, to basically force myself to attend this appointment that I just broke down at the thought my concerns were being dismissed and I was being fobbed off with a leaflet on IBS. Especially after I’d already done more research on IBS than what was contained in the leaflet. She seemed very apologetic and said she could do a blood test for anaemia if I wanted and if I still wasn’t feeling well in 4 weeks, I could go back and see her. Needless to say I haven’t been back. From my own vast research I have narrowed possibilities to – gluten sensitivity, SIBO (small intestine bacterical overgrowth), possible CANDIDA/Yeast infection/parasite, leaky gut, related thyroid issues. But honestly I feel it all stems from leaky gut caused by gluten sensitivity. I foolishly went back on to wheat to do a Coeliac Disease test but after 4 1/2 weeks I couldn’t stand it any more, I was supposed to eat wheat for 3 months. The past few months have been all consuming, physically / emotionally draining, I haven’t felt able to blog as well as everything else, you know when you just get fed up of thinking about food, symptoms, health, food, symptoms, health, blablabla. I suppose the reason for putting off an update is because blogging forces me to think and analyze my emotions, my body is so powerful at putting me in denial and allowing me to gloss over things, that sometimes, I don’t even realise I’m doing it. It just came to me today really, its almost like a survival mechanism. I eat well but feel worse. Scientifically I know that this is just a ”die off reaction” by the body, similar to the cold / flu like symptoms you may get at the start of any low carb plan. But physically / mentally my body is trying to protect me from these awful affects. It tries to convince me that the pain is too much, dont put yourself through it. Its so hard to eat well, feel great for a week and then the symptoms kick off, and trust me they are serious, trying to cope with a rambunctious toddler and these issues is a lot to take. It is upsetting because I feel like I should be able to cope better, I feel like a failure because I’m struggling with it all. My weight is up, but it’s not that which bothers me, I know I can lose weight, I know how to lose weight but I want to be healthy, I wish I knew how to do that. Hopefully pairing everything right back, possibly for some time and taking the probiotics / vitamins, etc will help, if not, I don’t know what I’m going to do. I’m just grateful that there are so many doctors / people in the medical profession willing to share experiences / theories / treatments on-line. Dr. Davis (Wheat Belly author) did a great article on when going wheat free isnt enough and the further steps you may have to take in order to improve your health. 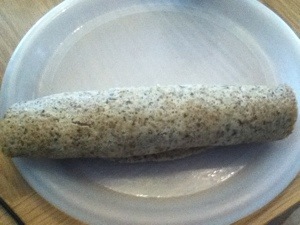 In the Wheat Belly book, Dr. Davis states that the wraps can be refrigerated and will keep for a few days. He also says that healthy variations are possible by simply adding various vegetable juices (such as spinach or carrot) in place of the water called for. Mix together all ingredients until blended. Grease a microwave safe glass or plastic pie pan with coconut oil. Pour in the batter and spread evenly over the bottom. Microwave on high for 2-3 minutes until cooked. Leave for about 5 minutes to cool. To remove lift up an edge with spatula. if it sticks use spatula to gently lift from the pan. Fill with whatever takes your fancy. I didnt use any additional coconut oil to grease the pan (its very expensive! 😉 ). I melted my coconut oil on the plastic plate I used to cook the wrap, once melted I added it to rest of ingredients, making sure plate was covered with oil before scraping it all into the rest of the mixture. I have had no problem with the wraps sticking. I added mixed herbs instead of paprika as I am not eating nightshades. I like quite a strong flavour so added 3/4 tsp of mixed herbs. I have made it a few times and it is very tasty, a great way to get some fibre and a nice replacement for bread if you need a quick fix breakfast or lunch. In my 700W microwave it takes about 2 – 2 1/2 minutes to cook. 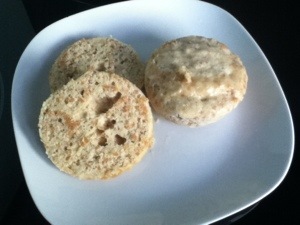 Combine milk, ground flaxseeds, coconut, walnuts in microwaveable bowl for one minute. Serve topped with cinnamon and berries if desired. The ground flax absorbs alot of moisture, so if using coconut milk you may need to add more milk depending on which consistency you prefer for your cereal. I used half a cup of coconut milk and it was a bit thick for my tastes, so I added a little more milk and cooked it for a bit longer. A good, quick, filling recipe. I cooked mine in 2 x 3.5” ramekins. ((A 4.5” ramekin would be able to hold all the mixture, rather than having to split it into 2 ramekins)). Microwave 800W / Time 1 min 30 secs. You can really add any flavours / spices you want to this, if adding cocoa powder make sure you add some more moisture, 1/2 TB cocoa = 1/2 TB water, etc. Melt oil / butter in ramekin/s. Whisk egg in seperate bowl, slowly drizzle in oil / butter. Add almond flour, flax and salt. Mix well. Sprinkle with baking powder and mix well again. Spoon into ramekin/s and microwave for one minute. My microwave isn’t very powerful, so it took another 30 seconds for me. 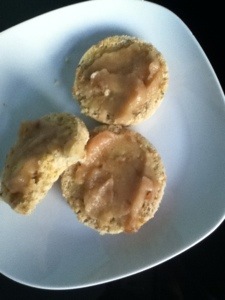 I loved this recipe, easy to make and very tasty, I spread mine with unsweetend apple sauce leftover from the Apple Walnut ”Bread”. 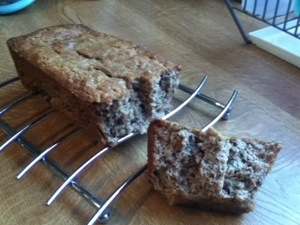 Apple Walnut ”Bread” (Makes 10-12 servings) Carb content 5g per slice. Coat 9 x 5” loaf pan with coconut oil. Combine dry ingredients and mix thoroughly – almonds / walnuts / flaxseed / cinnamon / baking powder / salt. Combine eggs, apple sauce, oil/butter and sour cream/coconut milk. Mix wet and dry ingredients. If the mixture is too stiff, add 1 – 2 tbsp coconut milk. 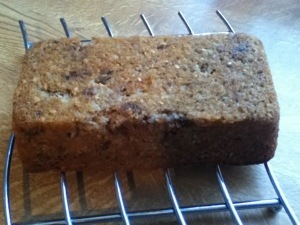 Press dough into loaf pan and bake for approx 45 minutes until a toothpick comes out clean. Allow to cool for 20 minutes in the pan, then turn out. I halved the recipe and it made 5 good sized portions. I baked mine in a 7.5 x 4” loaf pan. I used butter and sour cream, it was like a thick cake batter in consistency. 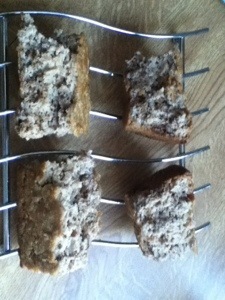 The bread when cooled was very moist and broke into pieces very easily. It was seriously delicious, next time I make it I think I will use butter and coconut milk. Easy to make and delicious, the crust is especially tasty, great cinnamon flavour. Put everything in a pan, bring to the boil and let boil for 10 minutes. Turn heat down, leave lid off and let simmer for 30 minutes. Puree , shouldn’t be much, if any water left so put everything in the processor / use hand blender. 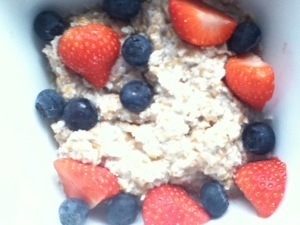 Dukan Diet start date - 12th October 2011. Height 5ft 7" / 170.2cm. Start Weight - 281.5llbs / 127.68kgs / 20st 1.5llbs. Dukan True Weight - 180.84llbs / 82.02kgs / 12st 12.84llbs. MET 12TH MAY 2012. Lowest Dukan Weight - 158.75llbs / 11st 4.75llbs / 72kgs. Start Low Carb Life - 28th November 2012. Ideal weight range 156llbs / 11st 2llbs / 70.76kgs - 161llbs / 11st 7llbs / 73.02kgs. 1. Read Wheat Belly. DONE 23rd October 2012. 2. Make a detailed Maintenance Plan. Done 28th November 2012 - follow low carb lifestyle, no more dieting. 3. Have a Healthy BMI 159llbs. 1. To weigh 245llbs or less by 31st December 2011. (met 10th December 2011). 2. Less than 80llbs to lose. (met 17th December 2011). 3.Weigh 239.5llbs by 31st December 2011 (3 stone lost). (met 17th December 2011). 4. Less than 70llbs to lose. (met 7th Januray 2012). 5. Reach Halfway Point - 60.25llbs left to lose by 28th January 2012. (MET 24TH JANUARY 2012). 6. To weigh less than 100kgs. (met 26th January 2012). 7. Lost 5 stone. (met 17th February 2012). 8. To weigh 210llbs (my 2004 weight) by 25th Feb 2012. (met 18th February 2012). 9. 40llbs left to lose - 2/3rds of the way through by 10th March 2012. (met 16th March 2012). 10. To weigh under 200llbs. (met 16th March 2012). 11. Lost 6 stone. (met 21st March 2012). 12. Lost 90llbs. (met 11th April 2012). 13. 13st 9llbs / 191llbs - BMI now overweight, NO LONGER OBESE!!!! also 3/4's of way through..... (met 11th April 2012). 14. Weigh less than Tim (13st 7lbs). (met 13th April 2012). 15. Lost 7 stone by 12th May 2012 (7 mths on Dukan) (met 2nd May 2012). 16. Lost 100llbs. (met 12th May 2012). 17. Reach Dukan True Weight - 180.84llbs. (MET 12TH MAY 2012!!!!!!!!). 18. **START COUCH TO 5K** at Dukan True Weight. (Started 13th May 2012). 19. Under 80kgs (met 1st June 2012). 20. Lost 8 stone. (met 1st July 2012). 21. Lost 120llbs. (met 10th August 2012). 22. Meet original goal weight 11st 7llbs / 161llbs / 73.02kgs. (met 19th August 2012).